I purchased this clock recently. It reminds me of one my grandparents had. Inside the door, the label is gold with a red border and has important instructions. It has the number 1806 at the top. It says "William L Gilbert Clock Company, Winsted CONN, U.S.A." at the bottom of that label. On the face rim on the inside by the hinge it is stamped "PAT Sept 17, 1920." 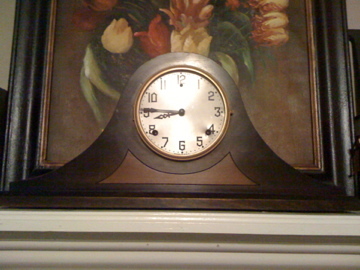 On the underneath of the clock it is stamped "Normandy Chime 2029" in the wood. On the brass plate on the back of the workings there is a "G" inside a diamond. The number 27 is stamped on the center of the brass plate and on the right is Made By WML Glibert Cl (letters after the "l" are covered), Winsted CONN.